Above radar imagery on April 27, 2014 courtesy of the College of Dupage NEXLAB. April featured a bit of everything for the Chicago area. The region experienced dramatic temperature swings, heavy rain, snow, and even severe weather. The first major weather system impacted the area April 3rd and 4th as a low pressure system brought heavy rain and strong winds to the area. The heaviest rain fell over locations farthest to the north, with some rainfall totals exceeding 1-2 inches. This rainfall was followed by a tight pressure gradient behind the system, which created strong wind gusts in excess of 45 mph across the windy city. 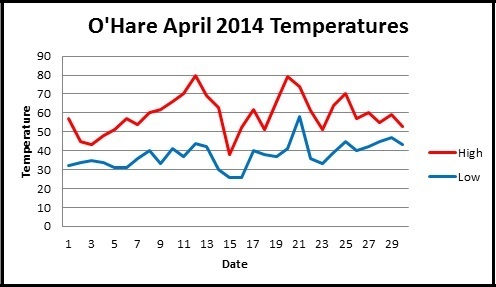 As previously mentioned, the month of April featured some dramatic temperature swings, which is typical for this time of year. In fact, temperatures soared into the upper 70s and lower 80s on April 12th, giving people a premature taste of summer. However, Mother Nature had other plans as a strong cold front would bring much colder air and a late season snowfall into the region. The snow melted on contact in many places, however, but there were measureable accumulations on some colder surfaces as seen below. As for snowfall totals, O’Hare Airport measured 1.4” of accumulation, with some localized totals greater than 2 inches. After the snow came to an end, highs did not make it out of the 30s thru April 15th, which proved to be the coldest “Tax Day” in 86 years. The cold weather would be brief, however, as temperatures bounced back into the mid to upper 70s on the 20th and 21st. Temperatures would fall back to normal levels on the 22nd, with seasonable temperatures continuing through the rest of the month. A weak frontal system then brought some rainfall to the area from the 24th through the 25th, but much more significant weather moved into the area for the end of the month. April 27th featured an upper-level low pressure system moving out of the Rockies and into the Midwest. This storm triggered plenty of severe weather across the center and southern portions of the country. While a deadly tornado outbreak struck the southern plains and deep south, some stronger thunderstorms even made it into the Chicago area April 29th with an advancing warm front. Several observations of small hail, frequent lightning and heavy downpours were reported over northern Illinois in association with the storms. Fortunately most of the severe caliber storms remained in west central and southern Illinois.